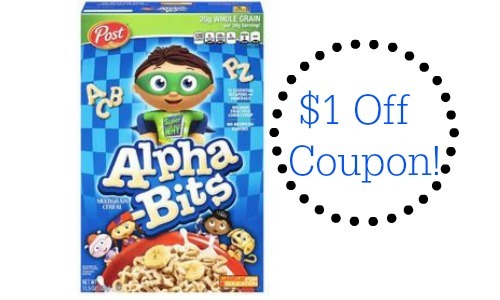 Go ahead and stock up on cereal for the family with a new $1 off Post Alpha Bits Cereal Coupon! This coupon has no size restrictions so you can use these on the 6 oz boxes. The cereal also often goes on sale B1G1, making it less than $1. Print your coupon now so you’ll be ready! Alpha Bits Cereal, $2.54 ea.